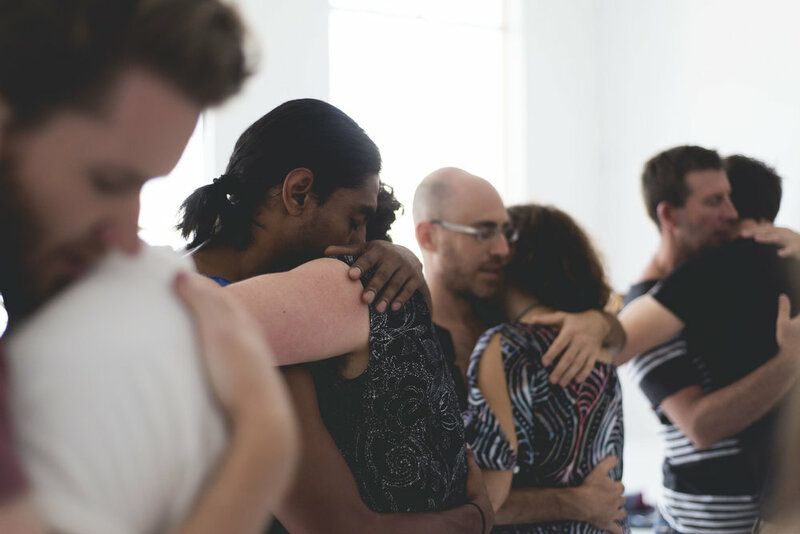 What is a Hugging Meditation? More than a hug... More than meditation. A hug is a non-verbal interaction, a universal form of physical intimacy, in which two people put their arms around one another and hold each other. Meditation is awareness; witnessing, relaxing in the moment, in the present. When we combine the two, it becomes something extraordinary -- a powerful, energetic connection that heals, transforms and awakens. By being conscious of our bodies and our breath, we create a certain level of "aliveness" within our energy system, making it easier to "consciously" connect to others' energetic fields. When two fields come together in an embrace, they begin to interact with one another, growing and generating more energy. The movement of energy between these two fields starts to detoxify the physical, mental and emotional body, allowing for individuals to let go of chronic tension, negative thought patterns and unprocessed feelings (sadness, anger, unworthiness, etc). The energetic connection produces oxytocin (the "love" hormone), reducing stress and social anxiety, while rebuilding confidence, self-assurance and self-love. This embrace, especially when held for an extended period of time, increases one's heart coherence, creating a stronger connection to intuition through the heart intelligence. It reinforces feelings of gratitude, compassion, love and appreciation, bringing more peace and joy to one's life and the world.